ABOUT 6% of the electricity generated in America is used to power air-conditioning systems that cool homes and offices. As countries such as Brazil, China and India grow richer, they will surely do likewise. Not only is that expensive for customers, it also raises emissions of greenhouse gases in the form both of carbon dioxide from burning power-station fuel and of the hydrofluorocarbons air conditioners use as refrigerants. As they describe in a paper in this week’s Science, Ronggui Yang and Xiaobo Yin of the University of Colorado, in Boulder, have a possible alternative to all this. They have invented a film that can cool buildings without the use of refrigerants and, remarkably, without drawing any power to do so. Better yet, this film can be made using standard roll-to-roll manufacturing methods at a cost of around 50 cents a square metre. Dr Yang and Dr Yin are not the first to try to cool buildings in this way. 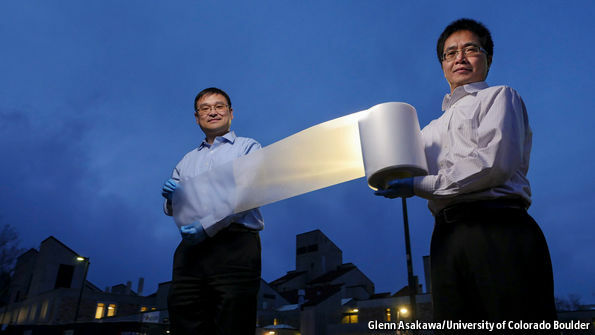 Shanhui Fan and his colleagues at Stanford University, in California, demonstrated a device that used the principle in 2014. Their material, though, consisted of seven alternating layers of hafnium dioxide and silicon dioxide of varying thicknesses, laid onto a wafer made of silicon. This would be difficult and expensive to manufacture in bulk. Dr Yang’s and Dr Yin’s film, by contrast, was made of polymethylpentene, a commercially available, transparent plastic sold under the brand name TPX. Into this they mixed tiny glass beads. They then drew the result out into sheets about 50 millionths of a metre (microns) thick, and silvered those sheets on one side. When laid out on a roof, the silver side is underneath. Incident sunlight is thus reflected back through the plastic, which stops it heating the building below. Preventing something warming up is not, though, the same as cooling it. The key to doing this is the glass beads. Temperature maintenance is not a static process. All objects both absorb and emit heat all the time, and the emissions are generally in the form of infrared radiation. In the case of the beads, the wavelength of this radiation is determined by their diameter. Handily, those with a diameter of about eight microns emit predominantly at wavelengths which pass straight through the infrared “window” in the atmosphere. Since the source of the heat that turns into this infrared is, in part, the building below, the effect is to cool the building. That cooling effect, 93 watts per square metre in direct sunlight, and more at night, is potent. The team estimates that 20 square metres of their film, placed atop an average American house, would be enough to keep the internal temperature at 20°C on a day when it was 37°C outside. To regulate the amount of cooling, any practical system involving the film would probably need water pipes to carry heat to it from the building’s interior. Manipulating the flow rate through these pipes as the outside temperature varied would keep the building’s temperature steady. Unlike the cooling system itself, these pumps would need power to operate. But not much of it. Other than that, all the work is done by the huge temperature difference, about 290°C, between the surface of the Earth and that of outer space. All rights reserved to the initial publisher for Economist.